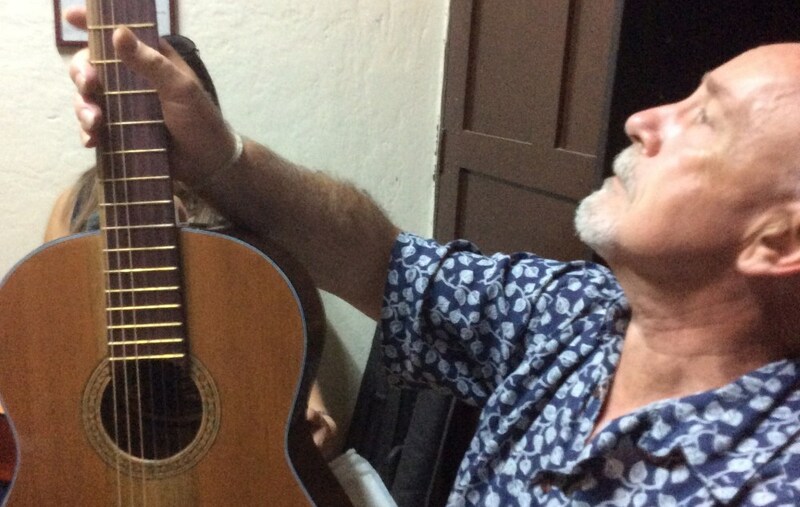 This is the story of my encounter with an unpretentious, cheap, but remarkable guitar that I discovered on a recent stay in Colombia and what I learned from a meeting with its designer and the local guitar industry which is centred in the city of Bucaramanga. “Spanish guitars”, “nylon string” guitars, or whatever you want to call them. It is simply NOT on the radar for those of us who are habituated to the received knowledge about the great guitar makers and the more recent innovators in Europe, the USA, Australia and even South America. Also, unlike neighbouring Venezuela, which boasts the great names of Antonio Lauro and Alirio Diaz, Colombia does not appear to be a place of notable guitaristic composers. This last point is actually untrue, and simply a result of my insular ignorance. Some time before this second trip to the country of Gabriel Garcia Marquez I discovered the remarkable compositions of at least two fine Colombian guitarist-composers, whose pieces are played by concert guitarists throughout the world – Adolfo Mejia Navarro (1905-1973) and Gentil Montaña (1942-2011). Until his recent death, Montaña was the leading classical guitar educator in the country, based at the Pedagogical and National universities. Colombia boasts well-established music conservatories and an active scene of young talented guitarists, some of whom have studied in the USA and Europe. Others now reside and work overseas. Also there are some highly-respected luthiers making fine instruments, most notably Alberto Paredes and Vicente Larraín. But this is not a story about a concert guitar, but a humbler specimen of the common guitar, the equivalent of those everyday stringed instruments that were spread to the New World from Spain, as played by the balladeers, beggars and ruffians that we see depicted in some of Goya’s paintings. Much as Andres Segovia wanted to downplay its seedy past, the guitar has its roots in these unpretentious folk instruments. It’s refreshing to know that in Colombia, (as in Mexico) the lower-end guitar market has not been entirely swamped by imported instruments from China, and they are actually cheaper, due of course to low labour costs. Many of them are pretty mediocre, but I chanced upon a really nice one. This story starts with my arrival in Bogota without a guitar. I had intended to take one with me to keep some technical practise going for the seven weeks of my stay, but United Airlines was going to charge me $200 each way to check in the instrument as “oversized baggage.” So, in a state of high dudgeon I left Melbourne without a guitar. After a few days I decided to seek out a cheap but reasonable quality instrument in Bogota, so after searching the available web sites of local music shops for prices and addresses I set off on my search. In Bogota, as with other large cities in South America (such as Rio e Janeiro) the musical instrument shops are concentrated in a specific zone, which reduces footslogging somewhat. In Bogota the place is Chapinero, a down-at-heel neighbourhood a little to the north of the central commercial district. The first shop I entered was not particularly promising, having a few Chinese-made Cort guitars (completely laminated) with a few low-end Alhambras and those shiny but mediocre Manuel Rodriguez instruments. I was keeping my budget to half the amount of the oversize baggage charge, so that restricted matters, given that the Rodriguez models were already priced at over a million Colombian Pesos (over $AU500). I could afford to pay at most 420,000 pesos ($AU200), preferably less - an impossibly low amount for a reasonable instrument? No, as it turned out. The second shop across the road stocked fewer nylon-string guitars, but my curiosity was piqued by one instrument with a pale-coloured fingerboard. Though I was told that is was “all-solid”, with “Cyprus” back- and sides it sounded very stifled and sported a thick clunky neck. Nevertheless, what was interesting was that it was made in Colombia. Armed with this new information I entered the third shop and mixed in with mass produced Spanish models, such as Admira (which were beyond my restricted budget) I discovered more of these locally-made nylon-string guitars– they looked nice enough, but they were over-lacquered with little volume. Looking at their labels, it seemed they were all made in the state of Santander, north of Bogota. In the fourth shop, a pale-orange coloured cut-away guitar met my eye – I was told that it was made with all solid wood and was called an “ecological guitar “– it was not lacquered and sounded better than the others, but I couldn’t make a judgement because the shop was crowded and noisy, so I left. Still intrigued by these Colombian-made guitars I then re-crossed the road to a fifth shop with the embarrassing name of “Bazoom Music”, and that’s where I found it. Entering the store I passed a rack with a row of nylon-string guitars, all with the same pale orange soundboards as in the previous shop. Immediately noticeable were the well-profiled necks of these instruments, a sign that some care had been put into their design. Yes, these were also named “ecological”, but I couldn’t quite follow the shop-assistant’s explanation for this term. In any case, the specimen that I immediately picked up and tested was reputedly all solid and the top was “Cedro.” (for which more later). In the large space of this modern showroom its clear mellow tone and volume were striking. And no part of the guitar appeared to be lacquered at all. Its mechanical tuners were cheap and nasty with metal rollers, and the strings were fairly inferior, but the action was great and it was comfortable to play. The rosette looked hand-made, another intriguing feature. I bought it for the princely sum of 360,000 pesos, or $AU170, cheaper than any of the fully-laminated Chinese models available at a higher price. Another thing about this guitar is that it is incredibly light in weight. In appearance it is simple and clean, with no bindings adorning the join between the soundboard and the sides. The headstock is plain but very well made. IThis simple, honest little guitar served my purposes well. Hardly a concert model, but it doesn’t pretend to be. I was happy practising scales, arpeggios and knocking out the odd Milonga, Tango or Bossa. The sound improved more when I fitted some Luthier brand strings which I had brought along. It also had a touch of the exotic which I felt compelled to explore. In fact over the next weeks I couldn’t stop marvelling at its rustic charm and together with my Colombian partner, decided to go in search of the maker of this instrument and ask questions about its production, design and materials. Although the music store with the stupid name of “Bazoom Music” had put their own label inside my guitar, the staff was happy to give me the telephone number of the real maker, and the address was for the city of Bucaramanga, where it now seemed clear that most Colombian guitars were manufactured. Bucaramanga is a city of about 1 million inhabitants about 300 kilometres north of Bogota in the mountainous area of northern Santander state, famous for its furniture making and other industries, including musical instruments. I soon found out that 98% percent of the guitars made in Colombia are made here. Unlike Brazil, which boasts two established brands of big guitar manufacturers (Di Georgio and Giannini), in Colombia, with a population less than a quarter of Brazil, guitar manufacturing is dispersed among some seventeen small enterprises. The maker of my guitar goes under the name of “La Clasica” and the manager, Martin Arevalo Sanchez, was happy to arrange an appointment to discuss details about his guitar making processes and methods. To avoid the 8 hour journey by bus through the hills, my partner and I took a half-hour aeroplane flight up to the city, stayed at a relative’s home overnight, then made an early-morning visit to Martin’s workshop and tiny showroom/office. We inspected the small factory with its seven workers and settled down for a discussion. During our discussion Martin confirmed that my guitar was made from solid wood with a hand-made rosette – in fact all the guitars produced by his firm are made from solid timbers. I had been curious about the name “Cedro” (Cedar) given to the wood of the soundboard; it is certainly nothing like the Canadian red cedar on my other classical guitars. Well, it turns out that this is simply a generic popular term for the wood “Cedrela Odorata” of the timber family MELIACEAE, known by other names including “Spanish Cedar” and “Honduras Cedar” or “Cedro Amargo” in Colombia. It is not at all related to the coniferous family of western red cedar (Thuja). It is a lightweight tropical timber within the same family as Mahogany, widely growing in northern Colombia and other parts of South America. Traditionally this wood is used for classical guitar necks, but I had not known its use for soundboards. It is distinctive for its orange colour and discontinuous grain. I have since found that it is actually used by some luthiers for soundboards. With its similarity to Honduran Mahogany, as a tonewood, Cedrela Ordorato produces a strong loud sound with a quick response and an emphasis on a warm, round midrange. The timber used for both the fingerboard and the back and sides is “Cordia Gerascanthas”, known in Colombia as “Moncoro” and elsewhere as “Bocote”– it is a tropical hardwood also known in English as “Spanish elm” and from the same family as Ziricote, which is used for some high-end classical guitars made in Spain. One luthier/supplier in the USA who sells and uses Moncoro/Bocote for classical guitar back and sides describes it as being much easier to work than Ziricote, with a similar weight and density to Cocobolo, with a brilliant ringing tap tone. So there I was, having discovered why my “environmental guitar” had such a warm, yet also strong sound. Another feature that seems to contribute to the strong mid-range tone of this guitar model is the peculiar bracing that Martin and his luthiers chose to use. It has what I could only describe as a “displaced fan-bracing”, with four braces radiating from the corner of the lower bout towards the bridge. But of course the other factor behind the tonal quality was that without the restrictions of any lacquer coating the guitar could breathe. Martin explained that the name “environmental” given to this line of guitars, actually refers simply to the firm’s avoidance of using any toxic synthetic lacquering and colouring on the guitar’s surface: instead, water-based tints are applied to the wood, mixed with natural oil. There is no claim by using this name that the timber used is free from endangerment. However I can note that Cedrela Odorata is listed by CITES only on the lowest ranking of species vulnerability (Appendix III) compared to Indian Rosewood which has recently been elevated to Appendix II and caused much angst among guitars dealers, importers and exporters. Cordia Gerascanthas does not appear to be CITES listed at all. So it seems that in addition to choosing a nice little guitar, I have made a politically-correct purchase! From my observation and comparison with some other makers in Bucaramanga that I also visited, Martin’s workshop (with just seven employees) seemed to be the most efficiently organized and produced the best-made instruments with the most effective quality control. Sure, other makers in this city (which produces 98% of all guitars made in Colombia) can make glossy and beautiful-looking nylon-string guitars, but for playability and tone I would pick those made by La Clasica. The “Ecological Guitar” is classified by them as a student model, and is only one of a number of lines produced by this firm. Martin and his workers do not pretend to make concert-level instruments or export beyond the neighbouring countries of Ecuador and Venezuela, and they could hardly compete with the instruments made by the better luthiers of Paracho in Mexico; their aim, however, is simply to produce and sell good quality solid-wood low-to mid-range guitars that can compete effectively with the laminated Chinese models which tend to dominate the urban music shops in Colombia. I hope they achieve this. As for me, I have a unique little gem in my instrument collection.